All you need to know about the recent APVMA label instruction changes in one place. Check out the new spray application video series from the GRDC! These videos were created to support growers and advisors in adhering to best practise and reduce the risk of off-target spray drift and increase awareness of the new 2,4-D label instructions. See the first of the videos below and you can find the rest of the series here. Which Nufarm products are affected? What are the advisory statements that affect me? Will product efficacy be affected with coarser droplets? What has the APVMA not changed? How do I predict or monitor inversions? When is the greatest risk of inversions? My boom height does not go below 50 cm boom height, can I still use this to spray 2,4-D products? Sprayers with OSST only deliver COARSE spray quality and have to be used with 75 cm boom height above the ground, can I spray 2,4-D? Can I apply 2,4-D products through a plane or helicopter? How do I know if my nozzle meets the new requirements *UPDATED APVMA NOZZLE CLASSIFICATION*? Will adjuvants increase droplet size? On 4 October 2018, the Australian Pesticides and Veterinary Medicines Authority (APVMA) announced interim measures from their review of 2,4-D which require new spray drift instructions for the 2018-19 season. The focus of these changes is to reduce the likelihood of spray drift damage. See the APVMA website for more details. All end users of 2,4-D products in all regions of Australia need to comply with the changes. All chemical manufacturers and suppliers of 2,4-D need to ensure labels are updated and these labels are supplied with all product sold. Advisory statements are recommendations and are not enforceable by the regulatory authority. They are provided to reduce the risk of drift and it is strongly recommended they be followed. Increasing droplet size and water rates while reducing application speed will assist in mitigating off target inversion drift during summer spraying. Extremely coarse droplets will produce <3% driftable droplets. Nufarm data indicates equivalent efficacy can be achieved with most target weeds and situations but water volume must be adjusted to minimum of 80 L/ha and speeds reduced to below 20km/hr. Only a slight reduction in efficacy has been seen in Autumn grass species with small vertical targets. With these weeds use the maximum label rate for that crop/situation and reduce speed to a slow as practicable. The latest GRDC information on maintaining efficacy of 2,4-D with larger droplets is available here. 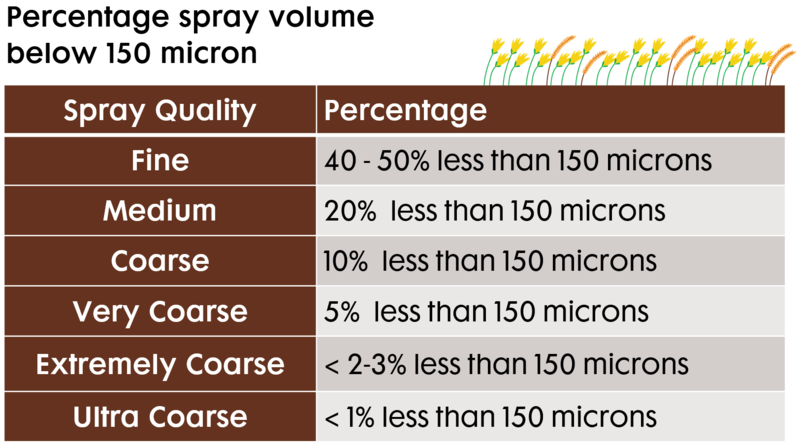 A benefit of increasing spray quality is to reduce the percentage of droplets below 150 micron. Droplets at or below 150 micron are unlikely to hit the target, and in warm conditions they evaporate prior to uptake by the leaf surface. These droplets are not effective in obtaining efficacy. Nufarm has developed a tool – our 24 hour SprayWise diagram – to show those high risk periods. You can download the tool by clicking the button below. My sprayer does not go below 75 cm, can I still use this to spray 2,4-D products? Permit only applies to Amicide Advance 700, Trooper 75-D, Cobber 475, Estercide Xtra 680, Zephyr 625, Amine 625, Baton Low and Estercide 800. Note that in situations where the target height is above 35 cm, the existing label requirements apply as this permit is not needed. For example, if the target height was 40 cm and the boom is set at 50 cm above the target (90 cm from the ground) then application could occur with a VERY COARSE droplet size (noting the advisory recommendation for EXTREMELY COARSE or ULTRA COARSE droplets during certain times of the year). Click here for a copy of the APVMA permit and ensure you fully read and understand it prior to use as different record keeping requirements apply in addition to the boom height and droplet size requirement. Sprayers with OSST (Optical Spot Spray Technology) (such as WEEDit) only deliver COARSE spray quality and have to be used with a 75 cm boom height above the ground, can I spray 2,4-D products? 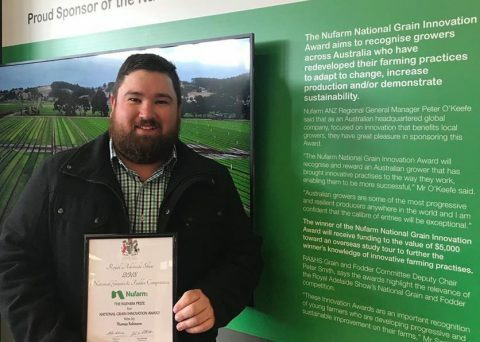 Nufarm and Croplands in conjunction with industry has worked with the APVMA to obtain permits to use Amicide Advance 700 and Trooper 75-D products through OSST units such as the WEEDit technology. The APVMA has issued a permit (PER87570) to use OSST technology which delivers only a COARSE spray quality with a 75 cm boom height above the ground if only 10% of the application area is treated. Yes, where aerial is specifically approved on label, 2,4-D products can be applied aerially if you adhere to the directions on the relevant Nufarm product label. Nufarm labels provide more flexibility for aerial users than the initial APVMA changes, these appear in the “Instructions for Mandatory VERY COARSE or Larger Droplet Size Categories” section of the GENERAL INSTRUCTIONS of the label. Alternatively, additional situations are covered in a permit issued by APVMA. Click here for a copy of the APVMA permit..
For products made on or after the 1 November 2018, updated labels will be on all products containing 2,4-D.
Only the back multifolds with the booklets will change initially. The new multifold booklets will have the notice below printed on the top to remind users of the changes. Updated labels can be accessed on the website via the product page. Please consult your nozzle suppliers for full details to obtain the most up to date information on which nozzles to use to obtain very coarse droplets. Changing to a high pressure air induction nozzles, such as the Hardi Injet™, Teejet™ TTI, or the Agrotop™ TD-XL-D is likely required, as low-pressure air induction nozzles Teejet™ AIXR or Hardi Minidrift™ are not able to produce Very Coarse, Xtra Coarse or Ultra Course droplets in sizes or pressure that suit most spray operations. High pressure air induction nozzles should be operated above 4 bar and offer best performance at 5-6 bar. If using Pulse Width Modulation Systems – a good choice would be Wilger™ MR-04 or Wilger™ SR-06 nozzles at pressures below 2.4 Bar. USE ONLY nozzles that the nozzles’ manufacturer has rated to deliver a VERY COARSE or larger droplet size category as referenced to ASAE S572 Standard (including all newer versions such as S572.1) or BCPC or ISO 25358. Choose a nozzle specified to provide the droplet size category required in the label Spray Drift Restraints. The APVMA has recently clarified its stance nozzle droplet size classification and now accepts five standards. Nozzle choice and operating pressure have the greatest influence on spray quality. Use only recommended adjuvants for the product. A ‘buffer zone’ is an area where pesticide application does not occur between the application site and an identified sensitive area which is downwind from the application site. For boom and aerial spraying, a buffer zone is measured from the edge of the sprayer swath closest to the downwind sensitive area; for vertical spraying, a buffer zone is measured from half a row width (i.e. trees, vines, other plants) outside the application site closest to the downwind sensitive area. DO NOT apply in a manner that may cause an unacceptable impact to native vegetation, agricultural crops, landscaped gardens and aquaculture production, or cause contamination of plant or livestock commodities, outside the application site from spray drift. Wherever possible, correctly use application equipment designed to reduce spray drift and apply when the wind direction is away from these sensitive areas. A ‘wetland’ may be natural or artificial and its water may be static or flowing, fresh, brackish or saline. Artificial ‘watercourses’ used exclusively for agricultural or ornamental purposes, such as irrigation channels, flood irrigation areas, farm dams, ornamental ponds, golf course dams, those used for aquacultural production, etc. Cotton Map is a tool developed by industry in conjunction with Nufarm which enables spray operators to see where cotton crops are growing. This allows applicators to plan spraying and avoiding times when weather conditions place neighbouring crops at high risk of drift. Bee connected is a nation-wide, user-driven smart-phone app that enables collaboration between beekeepers, farmers. SprayWise decisions is a web based tool which provides current weather information at a local level which allows applicators to make spray decisions based on real time information. Have a question we haven’t covered? Contact your local Territory Manager for more information.